This djembe is carved from one solid piece of plantation grown mahogany wood and is hand carved and painted with an African Congo motif. 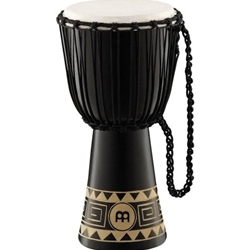 The sound quality of Headliner djembes from Meinl is unmatched in this price range. Hand selected goat heads combined with the traditional Mali weave rope tuning system come together to deliver cutting, high pitched slaps and deep, resonant bass tones. These drums sing and project with very little work, making them ideal for beginners and recreational players. The performance quality of Meinl Headliner djembes makes them a standard piece for any musical setting.